One of the most remarkable things about Doctor Who is its use of sound effects (‘special sound’) and music to suggest the psychological effects of environment. The programme has always experimented with sound effects and has often been celebrated for creating unease through specific soundscapes. In Season 7 we see a continuation of this process that actually reaches an apogee in Inferno. What’s interesting is how Brian Hodgson and the various composers in this period blend together effects and music, leaving the viewer unsure where effects start and end and music takes over. When Quinn arrives at Silurian HQ you hear Carey Blyton’s idiosyncratic music, the throb of Silurian bio technology, the screech of scanning equipment, the synthetic rumbles of the base door opening and finally the treated voices of the Silurians. All layered into one brief scene. It sounds very unearthly especially as the throb of the base takes over at the end of the conversation and it all ends with the screech of the scanning machine. When Quinn goes to find the injured Silurian the scene is punctuated by the sing-song sound of the Silurian tracker which essentially becomes a musical motif that escalates the mood of the impending arrival of the Silurian as seen via Tim Coombe’s marvelous point of view shots. In Inferno this mélange is heightened because it literally occurs for the entirety of the story and sound effects become musical tonalities and vice versa and help to maintain the tense, feverish atmosphere that is the story’s hallmark. Dudley Simpson also contributes to this merging of sound and music in Ambassadors where he contributes a poetic and lyrical piece of incidental music to accompany the space suited aliens silhouetted in the sunlight as they carry out Reegan’s orders. There’s also a strident theme for UNIT and some single plucked bass motifs to rack up the tension amidst more flurries of bizarre sonic messages from outer space, humming and throbbing noises coming from the Space Centre, its environs and Carrington’s secret laboratories. In Inferno we get what must arguably be the noisiest story of all time as the unearthly Delia Derbyshire soundscapes merge with a seemingly permanent soundtrack of drilling, industrial rumbling and pulsing and the synthesized howls of the Primords. No wonder everyone is shouting to be heard! Season 7, for its time, was also taking a more realistic approach to visual storytelling. The stories are helmed by directors keen to push the visual quality of the series into new areas, through editing and performance, and technically, through the use of processes such as Colour Separation Overlay. Spearhead From Space displays, by virtue of it being shot completely on film, a number of directorial flourishes that bring the show closer in tone to many of the ITC action adventure series as well as a similarity to news reportage in programmes such as ‘Panorama’ or ‘World In Action’. The Brigadier’s scuffle with the media at Ashbridge Cottage Hospital is point of view narrative and is directed, shot and edited as though it was a report to go out on the early evening news. Ambassadors goes one further and has Michael Wisher’s reporter directly addressing the camera to relate the events at the Space Centre in very much the same way audiences would have seen Apollo coverage in the early 1970s. These faux pieces of reportage would crop up again in later seasons giving the series a verisimilitude that’s only been attempted again recently in the new series. Silurians features a number of hand held, Silurian point of view shots, action orientated helicopter shots and a briskly edited sequence in central London that realistically depicts the onset of the plague. Ambassadors also contains a number of chase and action sequences, emulating many of the ITC adventures series, but also anticipating the groundbreaking all film action series ‘The Sweeney’ particularly in the car chase scene with Liz Shaw. The malleability of film and video is increasingly present in Season 7 from the tracking shot of the Brigadier in Spearhead to the stunning jump-cut in Inferno after a Primord bludgeons its first victim. The dynamism and grittiness of these ‘action thriller’ elements, given credence by the various gun battles, chases, dives off gasometers, brief case bombs, disguised bread vans and gas guns, which are present as strong Bondian elements, reposition the series as ‘action-adventure’. It’s all about the boys and their toys. The gritty male severity of Reegan in Ambassadors, with his cold despatch of the radiated corpses in the gravel pit, matches the hardness of the villains and gangsters in such seminal British films as ‘Get Carter’. He epitomises a more amoral, crueller masculinity prevalent in the gangster sub-cultures of the UK that had been the basis of series like ‘Special Branch’ ‘Big Breadwinner Hog’ and would later flourish in ‘The Sweeney’. 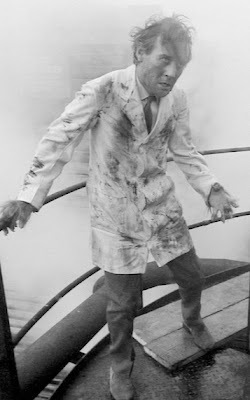 The Doctor himself becomes a centre of physical action, from the humourous shower scene in Spearhead, displaying a level of physicality never before seen in the series, to the fighting sequences with Primords and soldiers in Inferno. He oozes casual masculinity and in Silurians he’s seen as car mechanic, a T-shirted, jeans wearing forensic scientist and a potholer whilst in Ambassadors he’s a bone fide astronaut (compare him to the Troughton figure in The Seeds Of Death and you’ll see how the tone has shifted). The interrogation sequence in the parallel universe of Inferno is tough and no-nonsense and displays the Doctor as a resilient, physically strong individual. 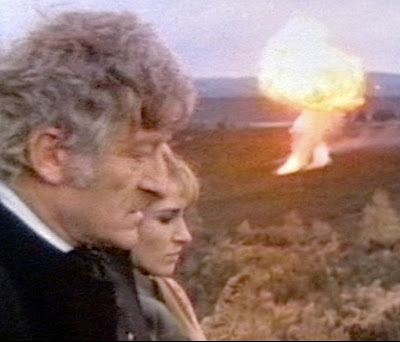 Just the fact that Pertwee is seen to sweat in this scene connotes the Doctor’s realistic physicality at the centre of the series. 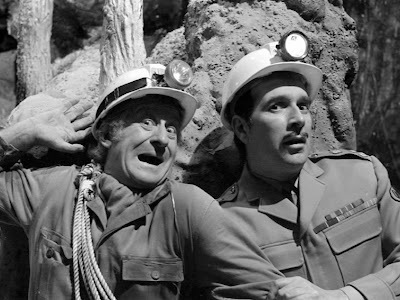 Sherwin and Bryant’s reformatting of the series, however bravura, was clearly not sustainable and current producer Barry Letts and his script-editor Terrance Dicks understood that the series could not maintain the ‘Earth exile’ scenario for much longer. It was obvious that the ‘yeti-in-a-loo’ format would result in repetitive storylines and a non-functioning time-travelling hero with nowhere to go. Letts and Dicks took steps to gradually return the Doctor to the status of traveller but did this whilst also continuing to explore further Earth based U.N.I.T stories. The dark legacy of Season 7 can still be seen filtered into The Mind Of Evil, a story that matches Ambassadors for domestic settings, power politics and paranoia and action sequences, The Claws Of Axos with its obsession on the exploitation of new energy (North Sea Oil take a bow) and small-minded civil servants, The Sea Devils as a less grim remount of Silurians and through to its eventual swan song in The Green Death with its psycho-sexual symbolism, and environmentalism versus fascism subtexts. The series Earth based formula has also clearly inspired the current revival with the opening story Rose emulating Spearhead From Space and later stories Aliens Of London and The Lazarus Experiment borrowing many elements of the Earth based formula. If there is a weakness with Season 7 then perhaps its structure is the main problem in that three of the four stories are seven episodes long and suffer to a degree from padding. Much of the conclusion of Silurians is the Doctor rather dully sitting at a laboratory bench looking for an antidote to the plague and it’s also clear that the problems in scripting Ambassadors do result in several chases too many and the longest rocket launch in history. 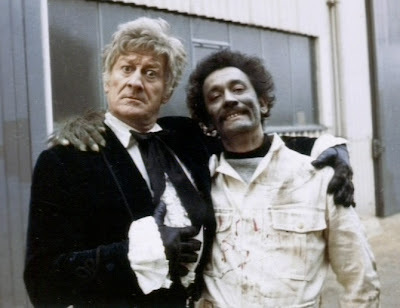 Pertwee misjudges his performance in the early episodes by being slightly too Troughtonesque but he clearly grows in confidence and has thoroughly established the Third Doctor by the conclusion of the Season. Despite these niggles, there is a consistent thematic tone for 25 episodes, unlike the later Letts seasons, and the like of which probably didn’t emerge again until the producership of Hinchcliffe. They stand as a fascinating exploration of the maturing of the Doctor’s character whilst he is, in effect, in confinement and it also sees the successful re-development of the series into a colourful, credible, gritty, thoughtful, action-adventure format with a charismatic leading man.